The St. Louis Black Repertory Company has done it again with a winning, filled with fun interpretation of Shakespeare’s “A Midsummer Night’s Dream.” Still set in the forest, this production reaches into the future (our past) and brings us some disco sounds from the ’70’s as Theseus and Hippolyta plan their nuptials with a little interruption from the dreamy world where they spend some time as Oberon and Titania, rulers of the fairies. Some of the dialogue is sung or chanted with familiar tunes from that decade while some of the background music also treats us to tunes such as the theme from “Sanford and Son” when the mechanicals enter for their rehearsal. The disco ball hanging high over the forest never drops, but it is a constant reminder that we’re in a very special place. Director Chris Anthony keeps the pace moving with a lot of action and the nimble choreography of Heather Beal enhances the theme. 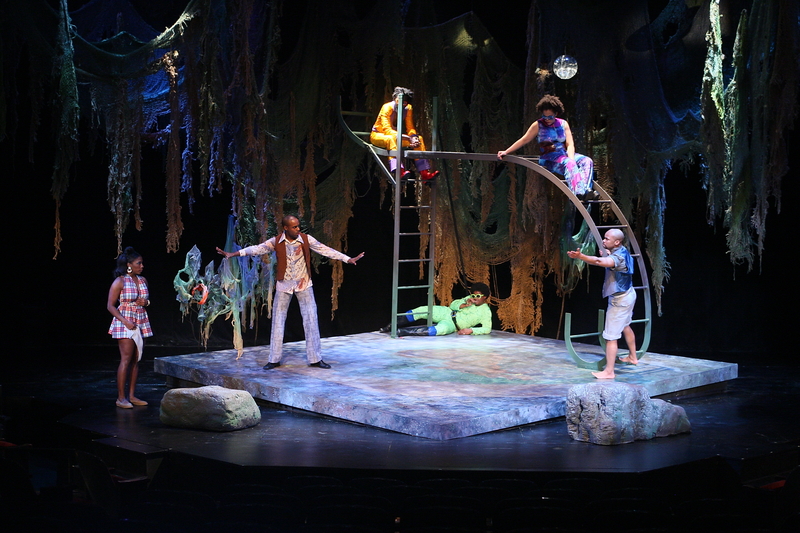 The Dunsai Dai set design evokes the whimsy of the play with an extended monkey bar breaking up the draping moss of the forest. Add the great lighting design of William H. Grant, III and the colorful costumes of Sarita Fellows and you’ve got a complete, concise production that brings laughter and joy to the audience. Robert Mitchell and Monica Parks shine as the king and queen. 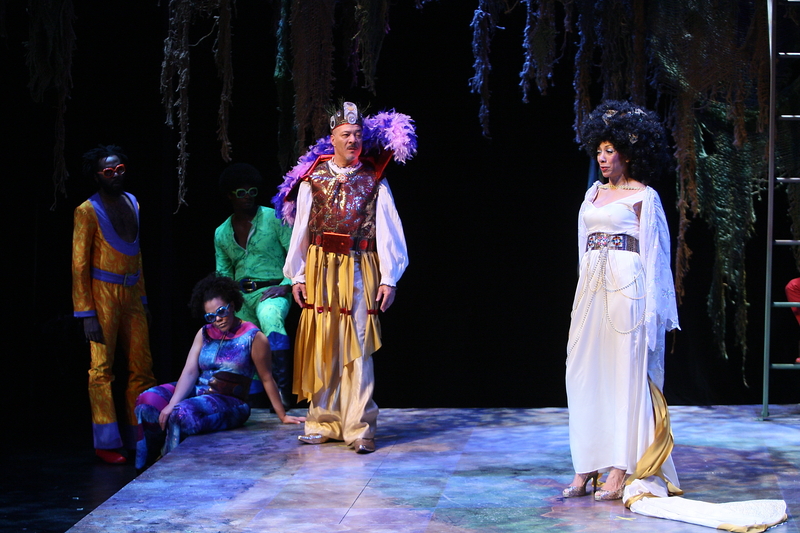 As Titania, she is drop dead gorgeous in a white, flowing gown and a sky-high Afro decorated with gold leaves. Mr. Mitchell effuses good will and cheer in his dual roles. The sprightly scamp, Puck, is given an athletic and delightful performance by Daniel D. Hodges, who also doubles up as the secretary to Theseus. The young star-crossed and double-crossed lovers are simply perfection. With Courtney Brown as a tenacious Hermia, Anthony Peeples as a determined Demetrius, Patrese D. McClain as the loving Helena and Chauncy Thomas as the bewildered Lysander, they make a fighting foursome that are a delight to watch as Puck changes and re-arranges their lives. Amy Loui is just superb as the leader of the Mechanicals, Peter Quince, as she attempts to prepare them for a play in honor of the king and queen. Her retinue, some who double up as fairies, include Matthew Galbreath in a knock-out performance as Bottom, Ryan Cunnigham who is hysterical in a tutu as the heroine, Thisbe in the little play, Candice Jeanine who doubles as Mustard Seed, Diamond Emelda Skinner who also plays Cobweb and Philip C. Dixon who does double duty as Moonshine. Rounding out the cast is Chad Morris who plays Hermia’s father and then miraculously becomes one of the singing, swinging, ’70’s inspired fairies. With so many inspired interpretations of Shakespeare’s plays over the years, this ranks up there with the most successful. Translating the forests and its environs to a disco-themed adventure complete with iridescent suits, lots of fringe and some truly funky music, is a real treat for the eyes and ears. You don’t want to miss this one- it’s a play for the ages. 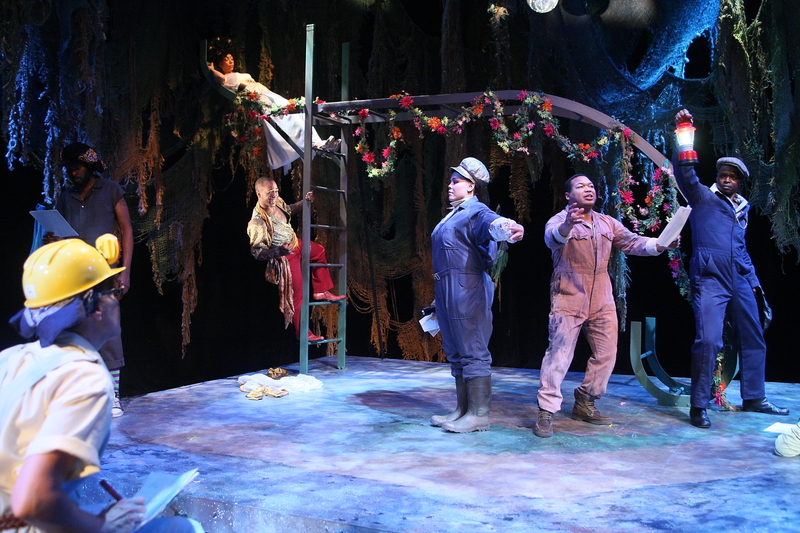 “A Midsummer Night’s Dream” plays through March 4th. Contact the Black Rep at 314-534-3810 or at theblackrep.org for tickets or more information. Party on! This entry was posted on February 20, 2012 at 9:43 pm02 and is filed under Uncategorized. You can follow any responses to this entry through the RSS 2.0 feed. You can leave a response, or trackback from your own site.